Here it is folks: the first installment of Sick Nick's Strapless Kitesurfing Series, covering the basics of strapless riding. For your edutainment, most footage is slowed to 1/4 or 1/2 speed. Keep a look out for the next installments in coming weeks -- 102: the Strapless Air and 103: the Duck Tack. Slick frickin flick, Sick Nick! Yeah!! I might be ready for 101..... er mebbe 089. Thanks Nick. Will try my 1st strapless day today at JI. I plan on staying well clear of any racers. Got a brand new Wainman Hawaii 6'3"!! Thank you Mr. Nick. 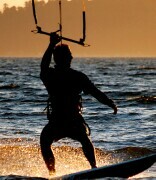 I am going to try this fluid type of kiteboarding. Do you have any recommendations on selecting board sizes, styles, fins, and the like? Thanks Nick. Just took the straps off my Slingshot Celeritas 5'8" (I'm 185lbs, 6foot) and can't wait to try the gybe. I think it will be easier to gybe strapless than with straps. Appreciate the great pointers!! Someday that will be Dr. Nick...Nice vid man, I bet this results in more strapless riders at the Jetty...I bet sunglasses would have helped, too! Location: Here comes the Sun! Excellent! But my attempts at switching foot position sure didn't end with the same result Thanks for taking the time to put this together. First I thought the music was too calm. What a fun video to watch. I found myself smiling and having fun just watching. Sick gets my vote for building the stoke. Now I am going to yell at him MORE on the water. That is just SICK NICK!!! Took my strapless out for the first time yesterday at the Spit and played for 2 hours before the crowds and wind went too wild. 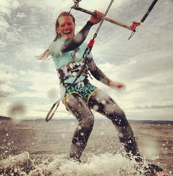 Your vid definitely works and certainly motivated me toward a whole new addictive kiteboarding discipline. This summer I'd estimate that greater than 50% of kiters at or past the WSB going toward the Hatch are on directionals. Less than 50% of those are strapless. That seems like much more than the past. Please keep cranking out the instructional vids. Take us to the 400 level! P.S. Any recommendations on board waxing would be greatly appreciated. Location: Gone With The Wind! !